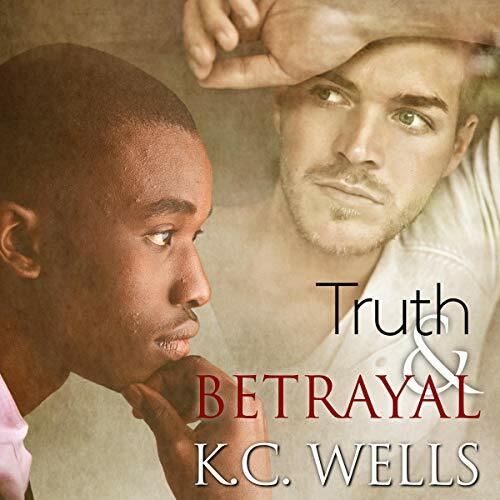 Erryn reviews ‘Truth & Betrayal’ by K.C. Wells. This book was released by the author on August, 2018, and is 403 pgs long. The audiobook version of this story was narrated by John Solo. It was released on December 26, 2018, and is 12 hrs and 52 mins long. A copy was provided in exchange for an honest review. Why I read this book: I have enjoyed every KC Wells book I’ve ever listened to and the premise intrigued me. Liam had known deep down that it was a mistake to go to Tennessee, but he’d hoped saying good-bye to Caleb would ease the pain inside him. The hostile reception from Caleb’s family and friends comes as no surprise, and Liam flees before things get ugly. They obviously know nothing of Caleb’s life in Atlanta, and maybe it’s better that way. Caleb’s secrets can die with him. When Jake turns up at Caleb’s apartment to collect his brother’s possessions, what he discovers is the first shock in what is to be a series of revelations, turning Jake’s world upside down. New knowledge brings fresh pain and anguish. Jake isn’t the only one who’s hurting…. When I heard about this book, I was intrigued. There has been a lot of debate whether covers with People of Color can sell as well as covers with Caucasians or just a generic design. Since KC Wells’ covers all have men on them, I was thrilled she took the risk to bring both Jake and Liam to life on the cover. I have no idea about sales, but I know a great book when I read one. I had hoped it would come out on audio so I was thrilled when that happened. I was even more pleased when I saw it was John Solo who would be narrating. This is a very long audio for the genre and at times it felt like the pace slowed but that worked given the subject material. And that material was deep. Losing a family member is tough, but losing a beloved brother while you’re even younger is beyond rough. Jake still can’t get over the fact his brother Caleb is dead, let alone the horrific manner of the death. The police have assured him it was an accident, but his desire for revenge is strong. His manner of coping is difficult to watch as it takes a really long time for the family to finally bury Caleb. The strange man showing up at the burial snaps Jake out of his grief for a moment and into the realm of rage. In the weeks that follow, that rage simmers down and a bleakness settles in. Finally deciding they’ve kept their heads in the sand long enough, Jake’s parents send him to Atlanta to retrieve Caleb’s belongings and then Jake really gets a shock. It turns out that Jake never really knew Caleb at all and his discovery of his brother’s secret life brings fresh waves of pain. I don’t want to give too much away because I went into the book not even having read the cover. I knew race would play an issue and suspected homophobia would as well. I wasn’t wrong but that didn’t make it any easier to watch the story unfold. I consider myself progressive and liberal-minded. I’ve been accused of being intolerant of people with other views. In other words, I don’t have much patience for racists, bigots, and homophobes. Is this a bad thing? To be accused of not being patient with people who aren’t open and understanding? I didn’t think so, but I’ve come to see that the way to change the hearts and minds of the intolerant is to talk to them. If they can’t see the error of their ways, that’s fine. But to write them off so summarily without giving them a chance? Well, that’s a path that is often taken but perhaps is just a bit too easy. I recommend this book because, aside from the deep emotions of the surface issues, there is a level of pain that is only felt when someone so young is lost so violently. Jake has to deal with his grief, his family’s beliefs, and his growing feelings for the man he believes responsible for his beloved brother’s death. The story is very much a slow burn. The first twelve chapters are all in Jake’s point of view and I wondered if the entire story was going to be that way. Once Liam’s voice came in, though, I was thrilled. Because his story is just as compelling, his grief just as raw. Which leads me back to the question – do we ever truly know a person? Can we know what’s in their hearts, their minds, and their souls? We often, with some hubris, believe we do. This brilliantly written book reminds us that even the tightest of relationships have to let in some light, some space between the lovers. It is also a story of redemption on so many levels. Can we atone for things in our pasts and move forward with only love in our hearts? It’s a question this book attempts to answer and does a fine job. John Solo handles the southern accents quite well. Deep enough to get the timbre but not so deep as to make the words incomprehensible. A challenge for most narrators, he walked the balance and brought this wonderful story to life. I highly recommend the book. Be prepared to be challenged in the best way possible. Thank you for the post and review. It has been a while since I’ve read a book by KC Wells and I haven’t given any of them a listen. It might be a good time check this one out. This sounds like an intense story, like most of this author’s works. Thanks for the nice review. This sounds wonderful. I hope to read it soon. I’m very excited about the audiobook! It is thrilling to hear the characters brought to life and bring another dimension to an already complex and wonderful story.